​​​​​​​Blogging is one of the best thing someone can fall into if you have the curriculum and time. When you write people tends to read it if its meaningful. As a beginner or a pro in blogging, the first thing or one of the ideas that should come into your mind when you have already created a blog is to customize your blog. Yes! How to make it look elegant and awesome to your visitors. That’s the essence of blogger templates, when you install a good looking template, your esteemed visitors will surely like to visit more because they love your blog design. Premium responsive blogger templates are there for you. Although there are free version of template all over the internet but I recommend blogger templates that has been coded clean. No fear of redirection to owners blog or hackers Penetration’s. Choosing the best template for your blog can be a stressful thing and lots of time wasting, there are thousand of template on the internet available for you to download but most of them aren’t or may not be what you want. In this article we are going to List out the best handpicked premium blogger template suitable for any niche you choose when starting a blog. But before that let’s look at the main reason why I recommend premium Responsive blogger template. Responsive templates are compatible with all screen sizes. And are visible on random devices. Also all scrolling system on small screen get fixed and unwanted features can be hidden. Premium blogger template loads faster than there counterparts(free templates) and this is one of the ranking factor Google SEO will review. When you use a premium template your blog tends to load extremely fast and thus attracts more visitors. Some free blogger template contains malicious code (not coded clean) and is absolutely prone to hackers attacks. But premium blogger templates can’t suffer such since the developer made sure they’re coded clean. Also redirection is one of the major factors to consider, when you use a free template there’s 35% assurance that your blog may redirect to ownners blog and if by possible you remove the credit at the footer, you will surely face tremendous redirection. Enough said already!.. 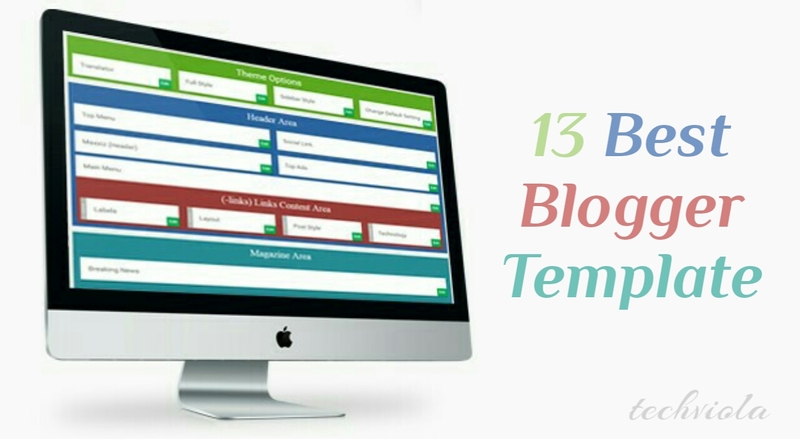 Below is the list of the 13 Best recommended blogger template you need to attract more visitors on your blog. 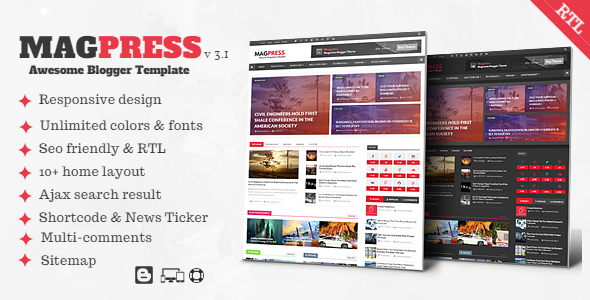 Magpress is a clean, modern, Responsive and flast blogger template customized with flexible approach that let’s you to easily change the colour skin, font size etc from the template designer menu. Magpress is best suitable for magazine, news, blog and multipurpose blogs. Magpress does not only excel at front end usability and user experience but the admin back end is very easy to use. Magpress features a popup contact form, powerful admin panel, multiple layout style for widget, SEO optimized, retina and AdSense ready. It also comes with a drag and drop widget support, Multi level drop down mega menu, fast loading and awesome footer style. 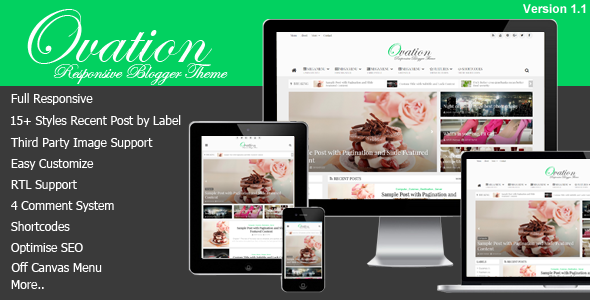 Ovation is a News, Magazine & Responsive Blogger theme most efficient for your magazine, news editorial and newspaper websites. Ovation have the ability to let you change layout for each categories, breadcrumbs for post and category, social widget and post widget. With ovation you can feel how cool and flexible blogspot magazine template can be and also turn your blog to any possibilities you can think of. Ovation features a third party image support, 4 comment system, SEO optimized, Recommend widget and AdSense ready. It also comes with a powerful dropdown menu, RTL support and review short codes. Amazin is a Responsive Multipurpose Blogger Template with amazing unique design and automated features that gives you power to simply and easily use this template. Amazin is integrated with many plugins and widgets, no need of any coding/HTML experience, no hacks or third party staff. Amazin features a powerful admin panel, RTL, Ajax search, SEO optimized and AdSense ready. It also supports disqus comment system, unlimited color for template customizations, fully Responsive and allows you to build home layout by Short code with a drag and drop widgets. 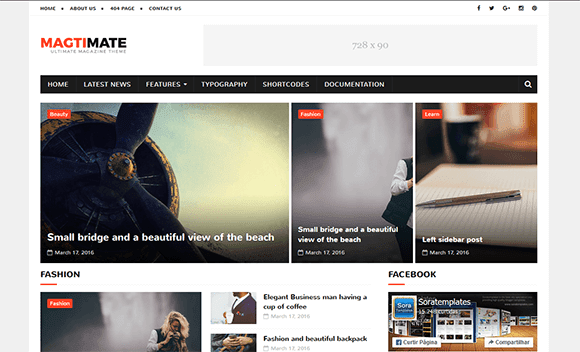 Magtimate is a clean, minimal and modern Responsive blogger template and can fit in various devices of different size. Magtimate supports all type of post format with a simple and elegant interface best suitable for any kind of news portal, Magazine, newspaper, travel and technology blogs. Magtimate features a Google testing tool validator, fast loading, SEO optimized, minimal and ads ready. It also comes with a clean layout, drop down menu, custom 404 page, social sharing and mobile friendly. 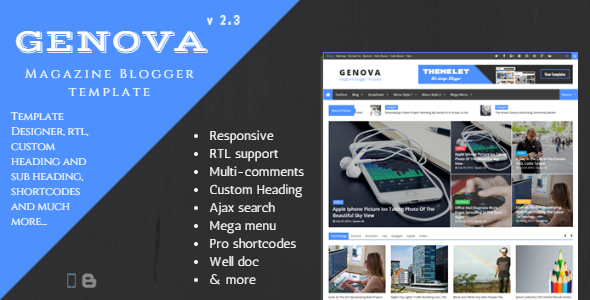 Genova is a Responsive Magazine Blogger Template fully integrated with social media and sharing buttons. Genova is power and SEO theme, coded with best blogger coding practices to maintain maximum performance and is perfect for multi blogging sites as well as for guest blogging. Genova features a powerful layout,flexible widget,RTL support,custom heading, subtitles and multi comments. It also features a mega menu, unlimited tabs in carousel and fast loafing speed. Genova symbolizes a classic Magazine theme with perfect accordion and all elements are designed pixel perfect just to make sure each line of code has its own worth. News52 is a professional and creative Magazine style Responsive blogger template. News52 newspaper blogger template is highly SEO optimized that helps to rank your blog on search engine as fast as possible. News52 is compatible with all mobile device and allows you to add blog logo with up to 15+ social icon. Want a professional look on your blog? Then news52 is the best option, the template is AdSense ready, features a breaking news and 2 comment system. Also it features unlimited colors, easy admin panel,drop down menu, author bio box and related post. The Template is best suitable for Magazine, tech and news blog. 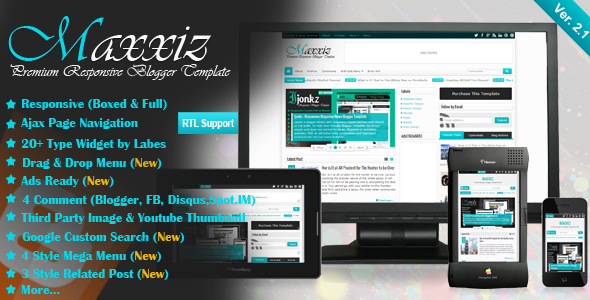 Maxxiz is a Responsive News & Magazine Blogger Template with a cool, simple and clean design. It comes with an attractive color combinations and impressed professionals. Powerful high user friendly blogger template with the ability to view mode list and grid on latest post width cookies and most suitable for news, magazine and portfolis blog. Maxxiz features a dropdown menu, powerful admin layout which helps you to easily work with your blog layout. It also comes with 5 style mega menu, 4 comment system, related post widget, allows visitors to increase/decrease text size on post and auto remember for future. 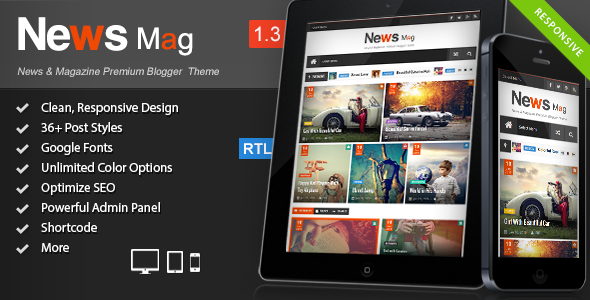 Magone is a Responsive News & Magazine Blogger Template enriched with easy customization. Magone is fast loading, clean, Mobile friendly and 100% widget ready. 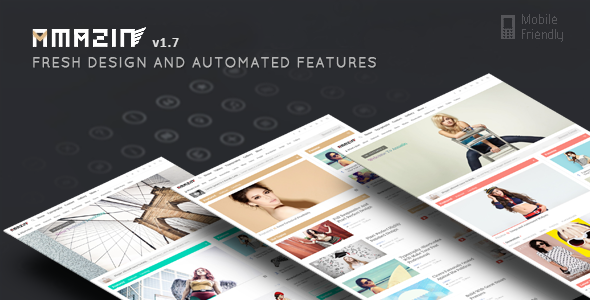 It also supports flexible widget for unlimited layout and best suitable for Magazine, portfolios and Newspaper blogs. 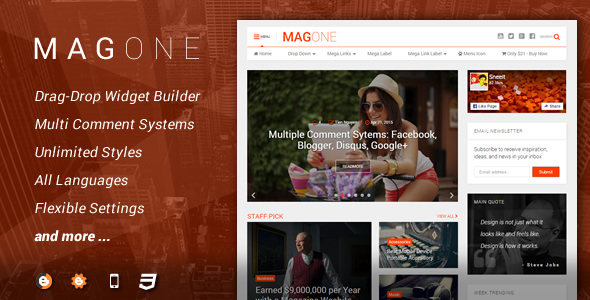 Magone features a drag and drop widget builder and multiple comment system. It also comes with a super mega menu and sticky sidebar to optimize your earning for sidebar advertisement. Fully Responsive and flexible menu navigation and supports custom archive page design. Magone is also compatible with SpotLingo, a tool that allows you to translate any languages. Soramag is a Responsive News & Magazine Blogger template with the focus of attracting and keeping visitors on your blog. It uses the best SEO practice and on top of that, its fast, simple and easy to use. Soramag is best suitable for technology, news and Magazine blogs.Not only is it responsive but it also keeps the magazine feel right down to mobile screen sizes. Practically every typographic element has been endlessly tweaked for different screen sizes to make sure it looks great no matter what the device. Soramag features a drop down menu, supports video, slider and mobile friendly. 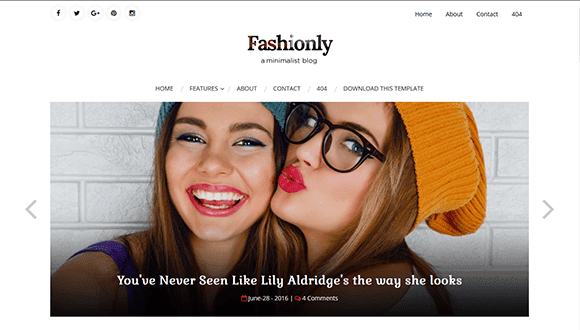 Fashionly is a Responsive blogger Template built to supports wide range of blog niches like fashion, lifestyle, travel, decoration and personal blogs. The Design is clean and minimal and it follows the latest design standards. Fashionly is full SEO optimized and also features a drop down menu, fast loading, custom 404 error mobile friendly and AdSense ready. 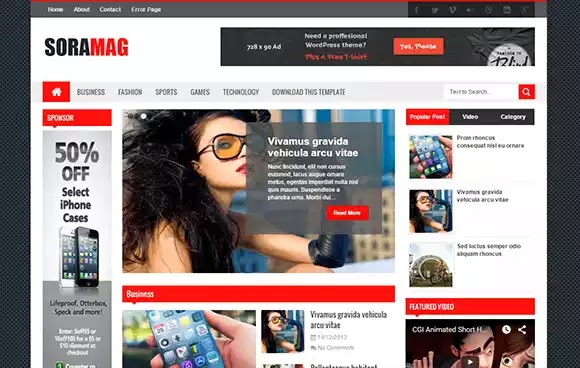 Aeromag is a News & Magazine Responsive Blogger Template designed with flexible layout, that lets users to easily manage their widgets by drag and drop. The template is coded under best practices to ensure optimum performance not only in Desktop but on mobile too. 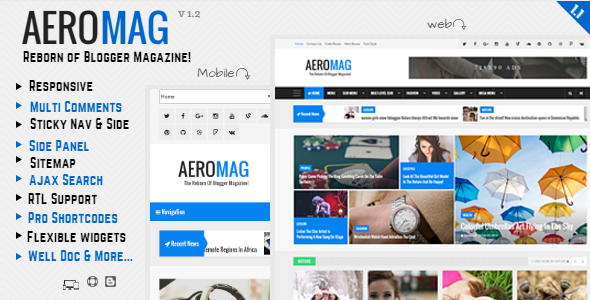 Aeromag is best suitable for news, Magazine and technology blogs. It comes with many features such as responsive design, clean and modern look. Side panel, custom contact form, Ajax Search, sitmap, mega menu and AdSense ready. 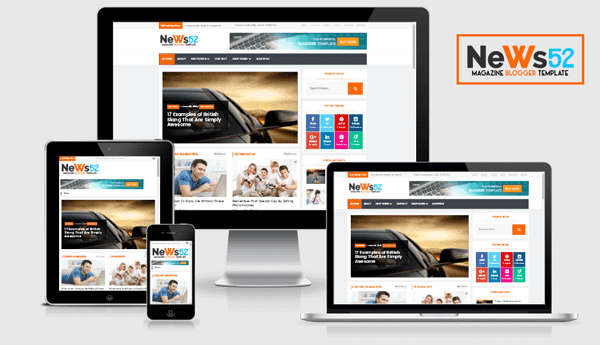 Newsmag is a Responsive Magazine Blogger Template best suitable for news, magazine and personal blogs. The template is absolutely mobile friendly and SEO theme. Newsmag features a powerful admin panel with theme option, retina and AdSense ready. It also comes with popup contact form, drag and drop widget support and 3 column footer. 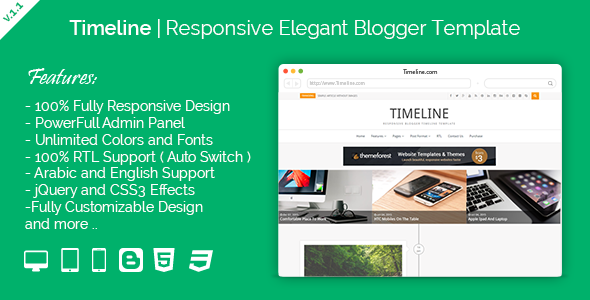 Timeline is a Simple, clean, person and modern Responsive Blogger Template. Its your perfect choice if you want to open a personal blog. The Template is SEO theme and does not required any coding practices. Timeline Provides many Features Like: Social Share in each Post, many Post Formats such as Video, Facebook, Twitter, SoundCloud, Youtube, Dailymotion, vimeo. It also features a rich snippets support, 4 column footer widget and a drop down menu optimized for mobile device. We hope this template furnishes your blog into something your visitors we love!. We are going to keep you updated with huge quality premium templates. So stay tuned and don’t go anywhere. Finally WhatsApp Video Calling Feature Is Officially Out. See It Live!.